Rockford Fosgate has built a solid reputation in the car audio industry. A lot of motorists trust the brand, what with its good quality amplifiers and subwoofers. The company has more than 35 years of experience in the highly competitive industry. It is not only known for its durable and good quality products, but also for its good customer support. There are several Rockford Fosgate subwoofers available in the market. But I’m picking five of the best subs from the brand. I’ve been reading a lot of good reviews on these subwoofers. Upon closer inspection, I could understand why many motorists have fallen in love with these Rockford Fosgate subs. Without a doubt, the Punch P3 series of Rockford Fosgate is what made the brand what it is today. The P3 series is one of the best selling range of car audio products. Many motorists agree that the Punch P3 series of amps, speakers, and subs have made Rockford Fosgate one of the top brands in the car audio industry. This 1200 watt peak subwoofer has some of the qualities that made that said series very popular. This is a sub that I can recommend to audiophiles and motorists who want to feel every beat in their music. If you’re one of those people who likes to listen to and experience powerful music, then you should check out this sub. This sub has a rigid, anodized aluminium cone that retains its shape through heavy play. It stays light and responsive even when the bass gets hot. Rockford employs a new technique in this sub, increasing its available cone area. This facilitates more air to go around and translates to even bigger bass. According to reviewers on Amazon.com, this subwoofer will destroy your car—figuratively speaking. It produces clean and deep bass. Clarity is retained even if you increase the volume level. Many reviewers suggest placing it in a ported enclosure. There aren’t a lot of complaints on this product; proof of how well built and powerful this model is. This is a mono amplifier subwoofer that can make a big difference in the quality of your car’s audio system. It’s small but wait until you hear the sound it can produce. It can drive a sub with up to 500 watts RMS. Suffice to say, you will feel your bass rocking if and when you install this model in your car. Once you open the product package, you will likely notice right away the heavy, aluminium chassis of this subwoofer. While it does add up to some weight to the subwoofer, it also draws heat from the internal components of the model. It thus ensures that the subwoofer would be able to function for a long time. This subwoofer has a wired remote control, allowing you to change the volume level from the front seat. It’s a nice bonus feature that makes customization of the sound a lot easier for users. While there are some reviewers on Amazon.com who say they had this subwoofer installed by a professional, most reviewers said that they were able to do the installation by themselves. It helps that the terminals are on one side of the amp, so wiring should be easy. This subwoofer should make your sound system a lot better. According to reviewers on Amazon.com, it produces tight and clean bass. This 10-inch subwoofer is also part of Rockford Fosgate’s famed Punch P3 series. As you have learned earlier, the said series is very popular among car audio enthusiasts. And this one , expectedly, lives up to the good reputation of that range. Similar to the 12-inch sub, this one has the familiar anodized aluminium cone. It also has an oversized rubber surround that increases cone area and results to bigger bass by pushing more air. This basically is the same as the other PS3D4, only slightly smaller. It’s a good choice for SUVs, mini trucks and even sedans. Power is also lower at 1000 watts compared to the 1200 watts of the 12-inch sub. But this sub won’t disappoint you if you’re looking for clean, accurate bass. According to reviewers on Amazon.com, this sub can provide a chest pounding thump. But it isn’t too loud enough to distract you. This is the kind of sub you might want to install in your car if you have an eclectic taste in music—meaning you appreciate old school rock to hip hop to EDM. Some reviewers on Amazon.com even say that this unit is the loudest 10-inch sub that they have ever come across. With the number of 10 inch subwoofers in the market, that's certainly saying a lot. To get the best sound quality, reviewers suggest putting it in a sealed enclosure. There are some reviewers, though, who say that it also has a tendency to sound like its blow in certain low frequencies. Not all drivers are willing to add a subwoofer in their trucks, fearing it would eat up precious cargo and passenger space. If you’re one of them, then you should consider getting this 10 inch shallow mount subwoofer. This subwoofer with a shallow loaded enclosure is less than six inches deep. This one should fit in nicely behind the back seats. It has a thick, medium density fibreboard with rugged black carpeting to protect it against the elements. While it is a bit heavy at 15 pounds, the weight all the more gives the unit a solid feel/look. It’s safe to assume that this subwoofer will last for a long time. The said enclosure hosts a prime, 10 inch sub that can handle up to 200 watts RMS. It has a mica-injected polypropylene cone. Surrounding it is a poly-foam rubber that results to accurate and clean bass. There are two mounting brackets and four screws included in the package. When paired with the appropriate amp, you can expect this shallow mount subwoofer to deliver the type of music that will have you humming along. The bass is tight and clean. It should give any music the right level of bass. Just don’t expect the bass to be overpowering. There are some reviewers who feel that the sound tends to suffer when the volume level is raised. But for motorists who don’t want to crank up the volume, this subwoofer won’t disappoint at all. Before discussing the good things about this subwoofer, let me mention perhaps the biggest drawback of this sub—its weight. Weighing in at more than 80 pounds, this sub will really add a lot of weight to your truck. But if you’re not worried about weight and more concerned about the sound quality, then this subwoofer could be the right addition to your vehicle’s audio system. There’s one word I can think of in describing this subwoofer—it is a beast. It may sound like an exaggeration to say that your truck will slowly fall apart and rattle away when you have this subwoofer installed. But that's how some Amazon.com describe the sound quality of this sub. Once the system has been broken in, the subwoofer gets too loud that your neighbours might shout at you for disturbing their sleep. The bass that this subwoofer produces is very deep, rich, and extended. It is also very accurate. Even audiophiles will be impressed with the sound that this subwoofer makes. It’s the subwoofer I can recommend to people who are into EDM, hip-hop and rock. The subwoofer’s weight not only adds 80 pounds or so to the cargo of your truck; it can also make installation difficult. As such, you will certainly need help if you decide to install it by yourself. It’s not surprising that many reviewers on Amazon.com said they had it professionally installed. 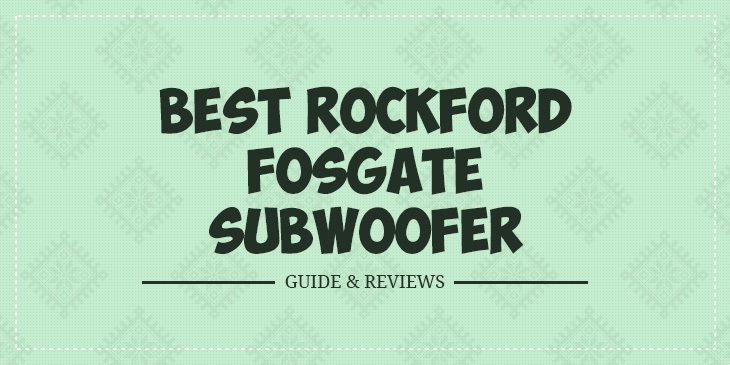 You will find any of these subwoofers from Rockford Fosgate worth buying. These subs can add extra bass to your existing car audio system. You'll certainly find yourself swinging your head and humming along to any song blasting on these subwoofers. And any of these subs can make your daily trips to the office a lot more bearable. I know how tough it can be to choose just one sub. You might have to base your choice on a few things such as the space in your vehicle and budget. Or even the installation, in case you are a handyman. But whatever model you're getting, you can be assured of a good quality subwoofer.